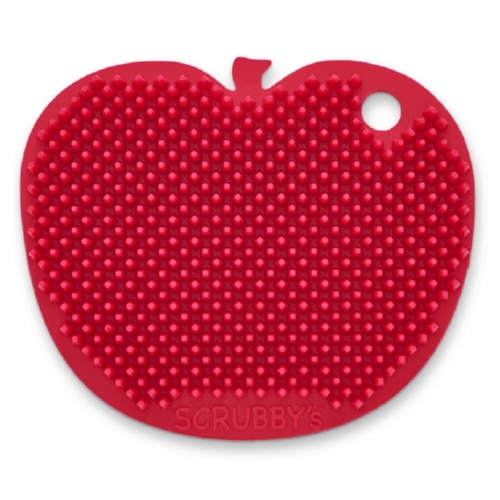 Scrubby’s is a brand-new family of long-lasting, no-odor silicone scrubbers featuring true Non-Scratch Abrasion with Square-Bristle scouring action which is useful in the kitchen, bath and elsewhere. APG created its unique patent pending Square-Bristle technology which provides thorough scouring action on dishes, glasses, pots & pans. Scrubby’s are very useful to prevent scratches on stainless steel, copper and silver. They also help preserve the seasoning on cast iron cookware. Scrubby’s uses and benefits are innumerable as reported by users; such as cleaning dishes, glassware, pots & pans, vegetables and fruit. There is no problem to get lipstick off a wine glass or coffee cup using Scrubby’s. Still others are using them as a bottle/jar opener & trivet/hot pad. They make an excellent soap dish and sponge rest which eliminates melting soap syndrome and those nasty sponge mildew odors in the kitchen. Soap bars last much longer when they are not sitting in water and many find them particularly useful in the shower & bath. Washing your hands with a Scrubby Duck when it is being used as a soap dish too is extremely handy. Adults love them for the shower and kids in their bath. Bathtub rings are no problem for Scrubby’s.